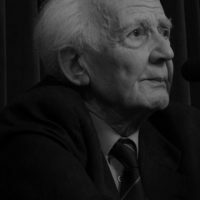 Zygmunt Bauman was one of Europe’s foremost sociologists and a prolific writer on contemporary society. Some of his best-known works include Liquid Modernity (2000) and Modernity and the Holocaust (1989). He received many honours for his work including the Theodor W. Adorno prize (1998).